I received products from Allswell, Interior Define, and Pink Elephant Organics featured in the post. All opinions are my own. 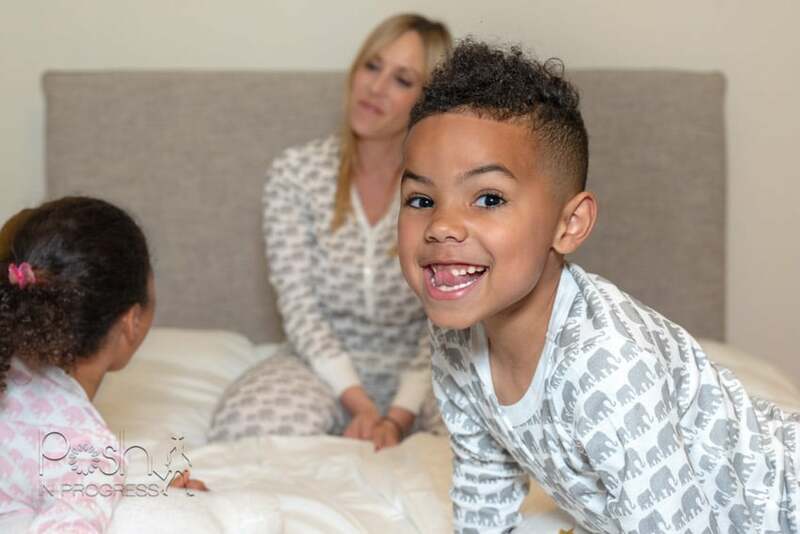 Alright moms, have you jumped on the family matching pajamas yet? When these adorable pjs arrived from Pink Elephant Organics (c/o), I was excited for a couple reasons. First, the pjs are super comfortable. Second, they are adorable! Third, my kids were actually thrilled to receive new pjs and even more excited that I had a matching pair too. I was actually pleasantly surprised how into it my kids were. I then realized I needed to document that moment. This is the first time that I’ve ever matched with my son. I did a couple matching shoots with my daughter in the past (here and here), but never with my baby boy. Although he did ask why my pjs weren’t pink like his sister’s, he was still very excited we matched. While we did this little shoot, I was struck by the fact that any day now, they aren’t going to want to do this with me. My kiddos are at the perfect age, where they sincerely enjoy spending time with me. They still get excited when they see me. They want to hold my hand, they want to give me hugs and kisses (even in public). My friends and family have warned me to cherish this age. I’m trying. I often get so wrapped up in the day to day stressors, that I forget to be present in the moment. This shoot was different. We just played, we wrestled, we hugged, and we had fun. I’m so happy we captured all the fun while also living in the moment together. My kids love my new Allswell mattress (c/o) and Interior Define bedframe (c/o), and my room is finally coming together. (Stay tuned for a complete reveal later this spring). I have never been a co-sleeper, so my kids don’t get that much time in my room. However, this was a fun departure for us. It’s amazing to me that something as simple as family matching pajamas was able to create so much fun for my kids and me. So, while I can, I am going to capture these moments, make them wear matching pjs, and learn to have fun in the moment – the very best that I can.